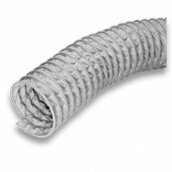 Designed as an exhaust & ventilation hose / duct for metal processing applications such as melting, refining, smelting, welding, forging. Internal stainless wire. External steel wearstrip.